Each of these box cars represents wood double sheathed construction. I start by using Prismacolor pencils to alter the shades of several boards. I used mineral orange, light umber, warm grey 70%, and cool grey 10% colors. The shades are kept random and applied to a couple of boards at a time. Don’t worry about the zebra look as washes will minimize this effect. I like to change the color of some running boards. This step is best done before the weathering washes. I used Prismacolor pencils again here, but I prefer to use grey or a new wood color acrylic paint applied with a microbrush. These pencil tones did not survive later weathering layers very well. A general wash is next. Light grey, burnt umber, and sand are my preferred colors. You can also mix a lighter shade of the car color in order to convey a faded appearance. The CCC&StL car above has had a light grey wash applied. Note how the color pencil shading on the boards has blended in to the appearance. I used the car bodies in the above images for a weathering clinic demonstration at a local NMRA meeting. I wanted to move these further along but decided to upgrade a few details. After the details were added, the new parts were touched up and the car was sprayed with a flat coat to prep for another grey wash. The flat coat helps to prevent any touch up paint from being washed away when a weathering wash is applied. The CCC&StL car above is complete. It has had two washes of acrylic grey. After the washes, raw umber PanPastel was applied along the sill and drawn up the sides with a sponge. The color was also daubed onto the ends and rubbed into place with a sponge. Neutral grey extra dark PanPastel was used for the soot. The roof was vigorously attacked and some color was drawn down the sides to highlight textures. After the PanPastel applications, a cool grey 10% Prismacolor pencil was used to highlight details and add chalk marks. The Pere Marquette car initially received a wash with a light red oxide acrylic in order to imitate fading paint. A second wash of a light mud color was applied to further lighten the car appearance. A bit of raw sienna and titanium white were mixed for the mud wash. Next up were the PanPastels. Some burnt sienna shade was applied and rubbed into the side surfaces to add more of a fade effect. Additional light gray was applied along the sill to represent road dust and the soot application was done last. A cool grey 10% Prismacolor pencil was used to highlight details and add chalk marks. Both of these cars wear the original Accurail paint and lettering. The CCC&StL car had the New York Central Lines oval replaced and both cars received new weight data. Blank decal sheet was painted slightly different shades then applied to the car bodies to represent areas where the old data was painted out. New data decals were applied on top of those before the PanPastel weathering layers. As a final touch, small route tags and remains of old tags were applied and remnants of a paper door seal were installed on the CCC&StL car. A pair of Westerfield SU box cars was weathered next. These cars were new in the 1922-1925 years so the weathering was applied lightly. The image above shows them just after they decals were applied and without weathering. This Mobile & Ohio car received a tan color wash, then PanPastels to represent dust, grime, and soot. The trusty cool grey 10% Prismacolor pencil was used to highlight details and add chalk marks. This Southern car received a slightly heavier tan color wash than the M&O sister. PanPastels were applied to represent dust, grime, and soot. The cool grey 10% Prismacolor pencil was used to highlight details and add chalk marks. tags and portions of old tags were glued to the car sides to finish this off. Note the last date line for the weight on both cars looks cleaner. Tamiya masking tape was used to cover these areas during the weathering process so the lettering looks like it was recently applied. Here are a couple more box car models before they rolled through the weathering factory. I try to take model images under the same lighting so readers can compare these painted and weathered cars. I painted several of these models with slight variations on box car red. After weathering they seem to have the same shade. The P&LE car here was supposed to be more of a brown oxide shade. I didn’t to a great job mixing the paint on the fly so I hope the weathering factory can make it look better. 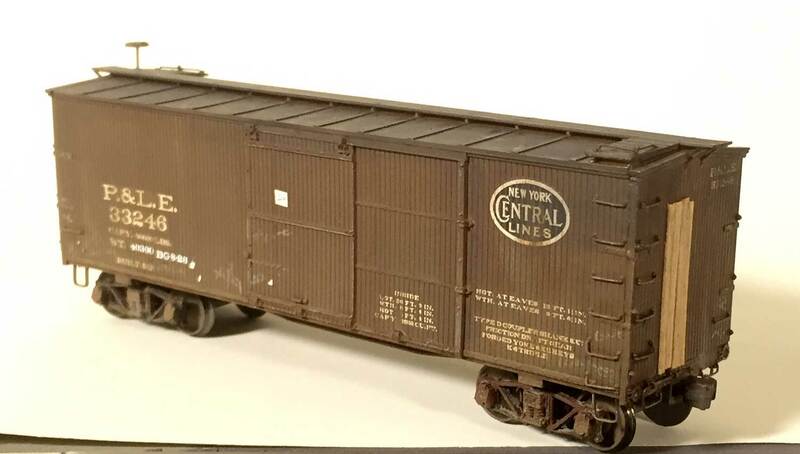 This Northern Pacific box car is a wonderful Yarmouth Model Works kit that was a joy to build. Check out my blog post when this was built a couple of years ago. Similar processes were employed to weather this model; wash, PanPastels, pencil highlights, tag application. I worked to convey a dusty effect on the car so a light sand wash was applied, followed by raw umber PanPastel. the prototypes were fairly new by my 1926 modeling moment, so the weathering was a light to medium application. This P&LE box car started as a Funaro & Camerlengo kit a couple of years ago, and somehow escaped documentation here on the blog. I wanted this car to look weary. An acrylic light grey wash was applied first. After it had dried, a flat coat was sprayed into the model. An oil-based burnt umber wash came next. The oil-based paint washes have a slightly different look than the acrylic washes. PanPastels were applied to mimic road dust and grime. When I applied the soot, apparently some crevices on the roof had not yet dried from the oil-based wash. An interesting wet effect resulted with the PanPastels. I enjoy trolling through old photos to spot neat freight cars in the background. In many photos from the Teens and Twenties, there is usually a car that has some sheathing damage. I decided to add this detail to the end of the P&LE box car using some stripwood. The boards were cut seven feet long and glued to the car end with canopy glue. Nail holes were added with a dental probe and a #2 pencil was used to lightly darken the stripwood. This isn’t a detail for every car in the fleet, but it is something to add for a car in need of service. Here’s another Funaro & Camerlengo kit that was featured on the blog in years past. 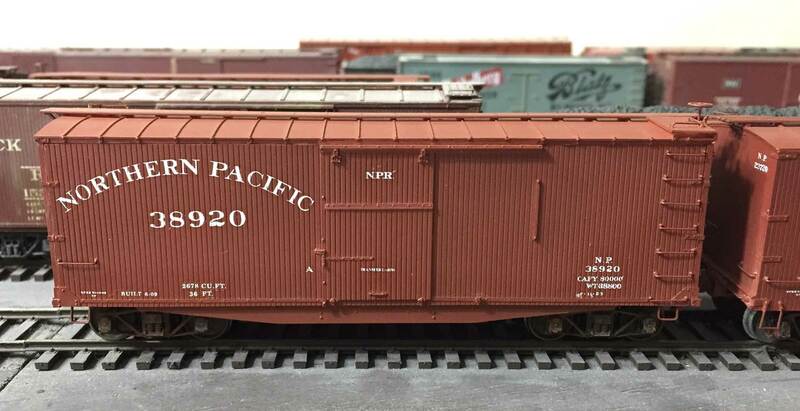 This is a distinctive, 36-foot, Northern Pacific box car with a fishbelly sidesill and radial roof. It was fun to build and the fishbelly sidesill obscured the view enough that the brake system detail was not installed. Yup, I cheated on this one. This Northern Pacific car was another model tagged to look weary and it went through the same processes as the P&LE car above. An acrylic light grey wash, the flat coat, then an oil-based burnt umber wash were applied in that order and allowing time to dry between layers. PanPastels were applied for dust and grime, and the cool grey 10% Prismacolor pencil was used to highlight details and add chalk marks. Tags and some tag remnants finished off the work. That sums up my weathering factory output for July 2016. The work went quickly as a couple of cars went through the same processes together. I always encourage people to pick up a few cheap older plastic models at a train show so they can use them to practice painting and weathering. The models don’t even need trucks or couplers! No matter how many weathering articles you read, the best way to learn is to get your hands dirty and try it yourself. Very nice work Eric; when using the washes, do you lay the car on its side or stand it up? How do you keep the washes from puddling around the hand holds? Thanks for your comment, Jim! If the car body can be removed from the under frame, then a paper towel tube is used as a holder. Blue foam can also be used but doesn’t have the springiness to be tight on the model. Plan ahead so you have something to set the tube onto so the model can dry. If the model is one piece, I will start on one side of the roof and work on a side by tipping the car back. I’m lucky it’s very dry here as the washes dry very quickly. Once the roof and upper part of the side is dry, I can work on the other side of the roof and car side. Sometimes I will work on the ends first and then focus on the roof and sides. Oil-based washes have a slower drying rate. Fine work Eric. Weathered cars definitely show effects of Mother Nature and age. BTW for fading of original color adding yellow to original color can also be effective. Would you be willing to explain (think weathering for dummies) a wash and how to accomplish it for those who are new to the task and live too far away to attend a clinic please? I too enjoy inhabiting the old Shorpy photos from the early 1900’s. You’ve captured the detail and “look” of these pieces of rolling stock. Very nice work, indeed!